From the leading name in shred-certified rock machines comes a guitar primed with the power for optimum rock action. Not only is the SM-1 With Seymour Duncans™ and Floyd Rose™ loaded with the kind of high-performance components that leading rock warriors demand, it’s also crafted with meticulous attention to detail in the top tonewoods with labor-intensive "through-neck" styling. 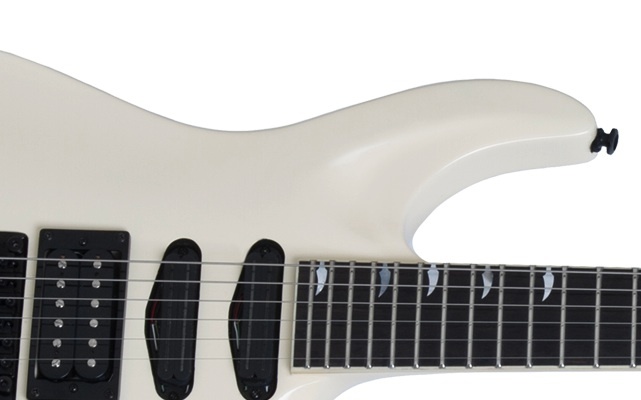 The result is a guitar of optimum versatility, searing tone, and unbridled sustain. In short, the SM-1 With Seymour Duncans™ and Floyd Rose™ is an unparalleled performance tool, ready to handle all the speed and aggression that any top rock virtuoso can throw its way. Finished in Vintage White gloss, the guitar is also every bit as stunning to look at as it is to play. Mahogany is a legendary tonewood, beloved by players and luthiers alike for its excellent blend of depth, richness and clarity. The body of the SM-1 With Seymour Duncans™ and Floyd Rose™ is made from solid mahogany, in a "through-neck" design in which another solid piece of mahogany forms both the neck and central body core. The neck itself is carved to the popular SlimTaper™ profile, known for its blend of speed and comfort, and topped with an ebony fingerboard with 24 medium-jumbo frets and a 12-inch radius. The guitar is built to the 25 1/2" scale length that many shredders prefer, which offers tight, thumping lows, crystal-clear highs, and shimmering harmonics.